So you're ready to earn your very first Arizona driver's license―congratulations! We're here to help. We know the process can seem rather complicated, which is why we've broken it down into easy-to-follow steps that will have you behind the wheel in no time. Surrendering the old license at the Motor Vehicle Division office. You will be issued a Class G graduated license, and will need to follow the driving restrictions listed below for a Class G license for the first 6 months the license is issued to you. Teens with out-of-state instruction permits must meet the requirements of Arizona's graduated driver licensing (GDL) program, outlined below. Arizona is one of many states that has implemented a graduated driver licensing (GDL) program, in which teens must complete a number of requirements before obtaining a full driver's license. In Arizona, teens must first earn a learner's permit, then a Class G graduated license, before earning a full Class D operator's license. A Driver's Ed course satisfies the requirement for the 30 hours of supervised driving practice required for a graduated driver's license. For more information, visit our page on Driver's Education in Arizona. 15 years and 6 months old: eligible for learner's permit. 16 years old: eligible for Class G graduated license. 18 years old: eligible for Class D driver's license. You may apply for a graduated instruction permit once you are 15 years and 6 months old. Before you do, it's a good idea to prepare yourself for the written exam. 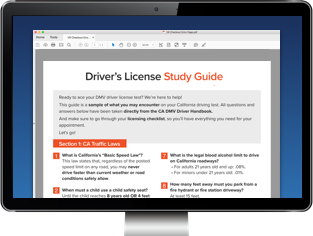 The MVD offers a basic practice test that you can study. Submit a Driver License Application (Form 40-5122). You may also start your application online. Provide 2 documents proving your identity. The MVD provides a list of identification requirements. Pay the $7 instruction permit fee. With your instruction permit, you must log at least 30 hours of supervised driving practice with a licensed driver 21 years old or older in the front seat at all times. 10 hours must be driven at night, and 20 hours during the daytime. You must hold your learner's permit for a minimum of 6 months before applying for your graduated driver's license. Once you've passed your written test, you will be issued your graduated instruction permit. You can now begin your behind-the-wheel practice. Once you are at least 16 years old and have held your learner's permit for at least 6 months, you're eligible for your Class G provisional license. Make sure you've either completed all 30 hours of supervised driving practice, or you've completed a state-approved Driver's Ed course (see above). ―Written certification from your parent/guardian proving that you completed 30 hours of supervised driving. ―Proof of completion from a state-approved driver's education course. 2 documents proving your identity, with at least 1 document showing your photo. If you do not have a photo ID, you'll need 3 documents of identity. The registration and proof of insurance for the vehicle you will be testing in. A completed Driver License Application (Form 40-5122), which can be started online. Parent or legal guardian's signature must be notarized or witnessed by an MVD agent for applicants under 18 years old. Payment for the $25 driver's license fee. Once you pass your DMV road test, you will earn your Class G graduated driver's license. You will keep this license until you turn 18 years old. ―You are driving with your parent/guardian in the front seat. ―You are driving to or from work, church, school, or because of a family emergency. After the first 6 months, as long as you have not received any traffic violations or license suspensions, these parameters will be lifted, and you may drive without restriction. As a licensed driver, it is important that you remember the that while you are behind the wheel, you must have all your attention dedicated to the task of driving. Learn all about the dangers of driving distracted by visiting the Distracted Driving section of our website. Once you turn 18 years old, you are eligible to apply for a Class D operator's license. You may either continue to use your Class G provisional license, or you may choose to obtain a new duplicate license with the Class D designation. Acceptable documents proving your identity (see above). A Driver License Application (Form 40-5122). Payment for the $12 duplicate license fee. You can also obtain a duplicate driver's license online, OR by phone, and by mail, IF you're an active military member or a dependent of an active military member stationed outside of the state. Online―Visit the Service Arizona website. While you complete the steps towards your first Arizona driver's license, you can follow our new driver checklist. You must have auto insurance to drive on Arizona roads, and you must show proof of insurance in order to obtain a driver's license. Adding a teen to a policy can cause prices to skyrocket, so make sure you shop around for the best provider for your family. Teens with learner's permits may be covered under the insurance of the adult licensed driver who is riding with them. It's wise to contact your insurance company to verify that you are covered when driving the vehicle with an insured adult. If not, it is very important to get an insurance policy that covers the you while driving with a permit. Teen drivers are required to show proof of insurance in order to get their driver's license. You may be added to your family's existing policy, a parent's policy, or you might get your own policy. Two forms of acceptable identification. You will need to pass the motorcycle DMV written test before you're issued your motorcycle permit. If you haven't yet obtained a regular Class G or D driver's license, you'll also need to pass the written driver's licensing test. With your permit, you may only drive with a licensed motorcycle driver alongside you. You may not drive between sunset and sunrise, or on freeways or interstate highways. Your permit is valid for 7 months. Have held a motorcycle learner's permit for at least 6 months. ―Pass an approved motorcycle rider education course. ―Complete at least 30 hours of motorcycle riding practice, with your parent/guardian's written certification. Pay the $25 license fee, or the $7 motorcycle endorsement fee if you already have a Class G or D driver's license.